This was a real challenge as the extreme masking technique, which was my choice, actually works better on a larger substrate, where you can add more layers of stamping detail. However, sometimes it's good to play outside your comfort zone !!!!!! 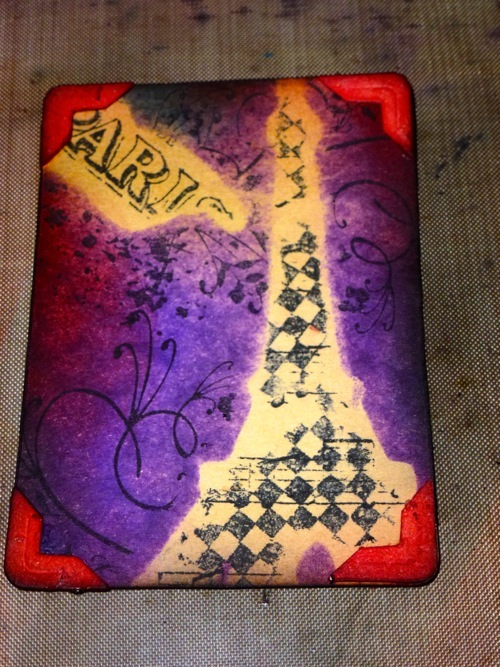 I cut my ATC using Tim Holtz Bigz Die, which includes small corners. 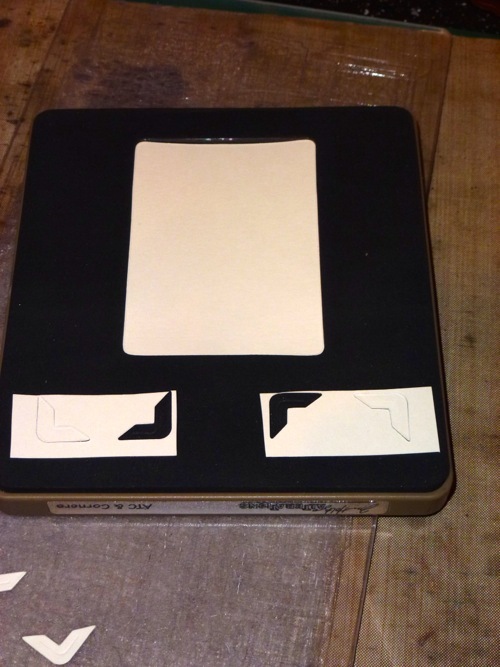 As I did not have any of Tim's masking sheets I required to improvise. To do this I took the stamp and die set you can see below, cutting out the dies, which also left me with a negative over which to stamp. 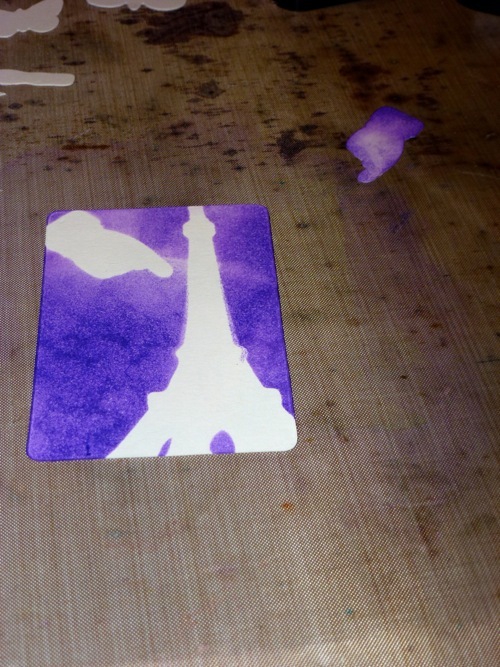 Holding the disc cut pieces in place I began to ink the ATC using Wilted Violet DI. Once complete I applied Festive Berries and Mermaid Lagoon DI's. Once I was happy with the blend of colours on my ATC I inked some Tim Holtz stamps with Jet Black Archival Ink. 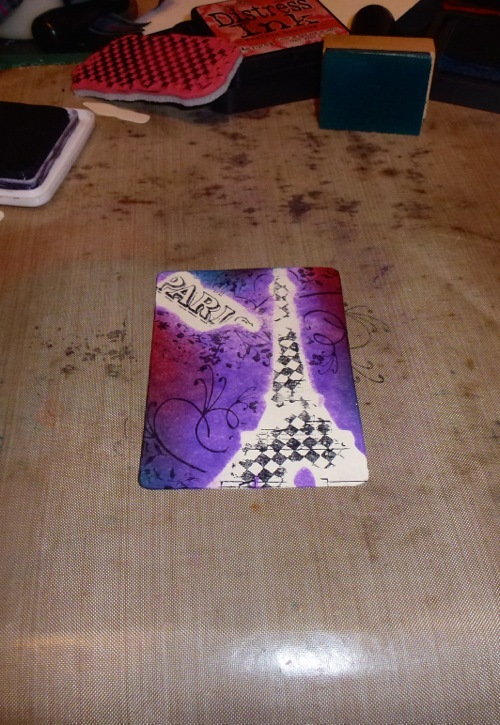 The ATC corners were inked with Festive Berries DI and then adhered to the ATC with Cosmic Shimmer Glue. I applied some glue to my non stick mat and used my fingers to apply it to my corners. Rub Ons were then applied to the ATC creating a further layer. 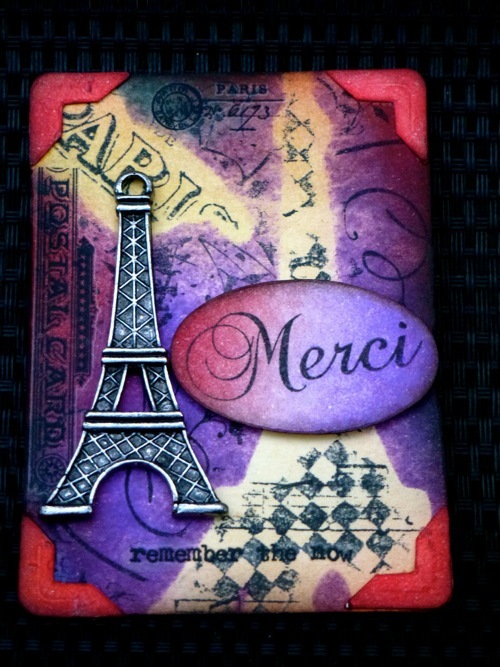 I also added an embellishment from my stash and a little disc on which I stamped Merci. 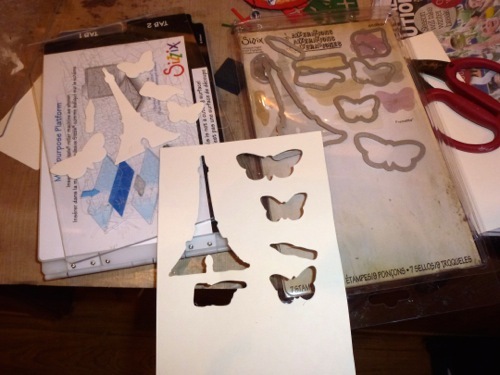 The same technique was applied to the second ATC below using the butterfly die cuts from the same set as the Eiffel Tower etc. I applied Vintage Photo and Festive Berries DI's and more stamping of Tim's Stampers Anonymous stamps. More Rub Ons were applied using the rub on tool. And there you have it two ATC's using Tim's Extreme Masking Technique, Festive Berries DI and Rub-Ons. 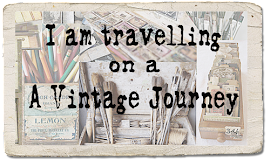 Our current monthly challenge is 'Vintage Christmas'(details HERE) and it would be lovely to see you joining in. 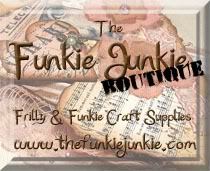 Do please check out what my talented teamies have created to inspire you. 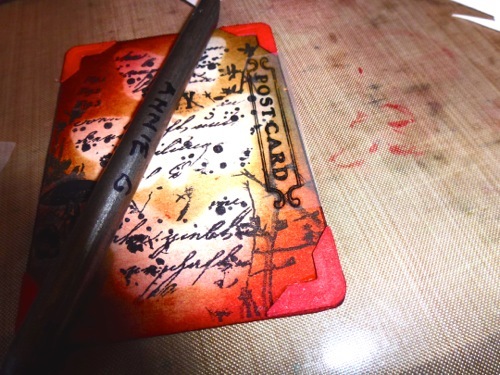 How clever to use the Framelits - and what fabulous ATCs you've created. 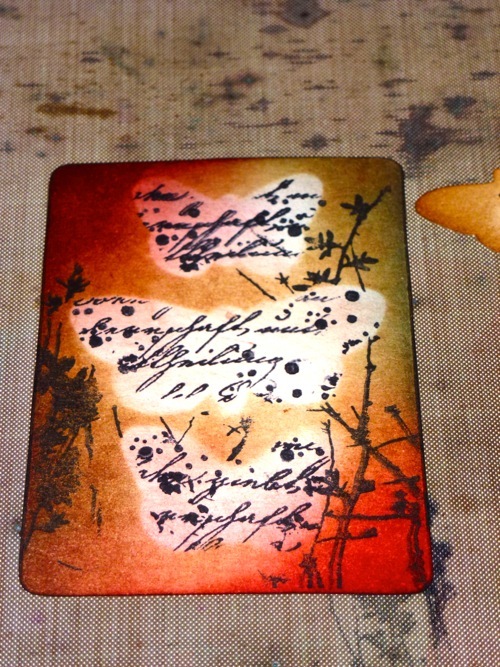 I love the colours - so vivid and beautifully blended - and the stamping looks fantastic. 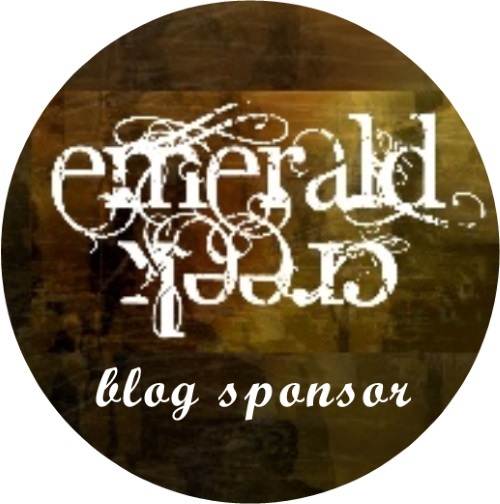 What a great Destination Inspiration post! 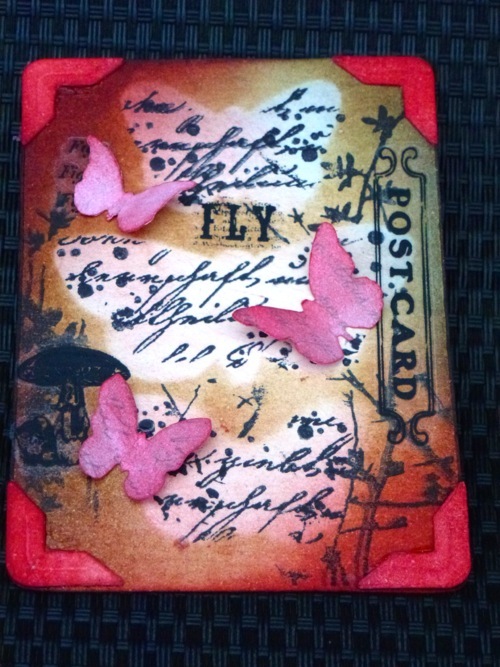 Love your thinking outside of the box Annie to create these two beautiful ATCs. Both are gorgeous mini works of art with gorgeous colours and imagery. Great job with your travel bag contents. 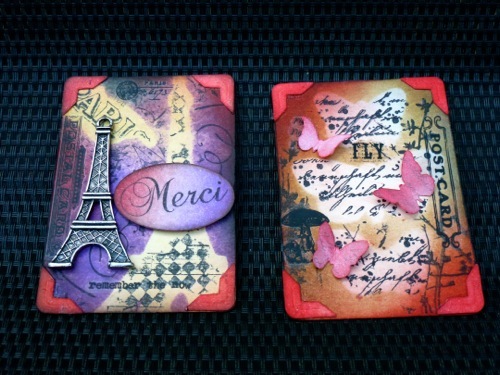 Beautifully styled ATC's Annie and great vibrant colours. Two fabulous ATC's Annie using the travel bag ingredients . Such clever improvisation too! Beautiful Annie!! Love the red and purple together!